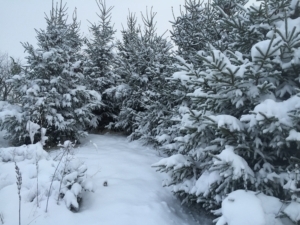 A properly designed windbreak or hedge around a home, commercial building or livestock facility can dramatically change the weather conditions, and the overall appearance, for the better. The most common reason windbreaks are planted is to redirect the wind pattern. A properly designed windbreak can reroute the harsh winds over and around an area. Overall height, length of rows and number of rows are the three most important factors in planning the best windbreak for you. Properly designed windbreaks and shade tree placement can have a strong impact on your energy bills. Additionally, trees can increase livestock growth efficiency by cooling feedlots, or protecting from cold winter winds. Similar to a snow fence, shrubs and trees can be used as a living snow fence to control where the snow drops on your property, and once established will keep the drift off your driveways, roof, livestock facility and other areas. Ideally, the inside row of your windbreak should be planted 100 feet away from a building to avoid unwanted snow dropping on the roof. By redirecting the way air flows around and over your livestock, poultry barn or feedlot, windbreaks can help reduce the smell of livestock by as much as 15% according to Iowa State University. The main idea is to mix fresh air with the air, dust and ammonia coming from the barn or feedlot to reduce the smell. This is a very common windbreak goal, for farmers and neighbors. It should come as no surprise that trees on your property can dramatically increase the overall value. Some studies show mature trees can increase real estate values by as much as 30 percent. Additionally, according to the USDA well-designed and placed windbreaks can reduce energy costs by as much as 20 to 40 percent. Planting trees is an easy way to improve the overall appearance of your property. The natural look of trees can help soften the sometimes harshness of homes, buildings, livestock facilities or other structures. Trees are often used around livestock facilities to improve neighbor relations by visually screening the facility from neighboring homes or roads. Trees play a large role in our environment and by planting trees you are providing a valuable asset for your community. Trees earn their keep for many reasons, such as preventing soil erosion by wind and water, absorbing carbon dioxide, providing the oxygen we breath, controlling global temperatures, the list goes on. Questions? We’re here to help. Feel free to call, email or use the contact form to get in touch with us.